Seriously, Sam, how many different plaid shirts does one person need? This one alternates between blue and light brown in its plaid. 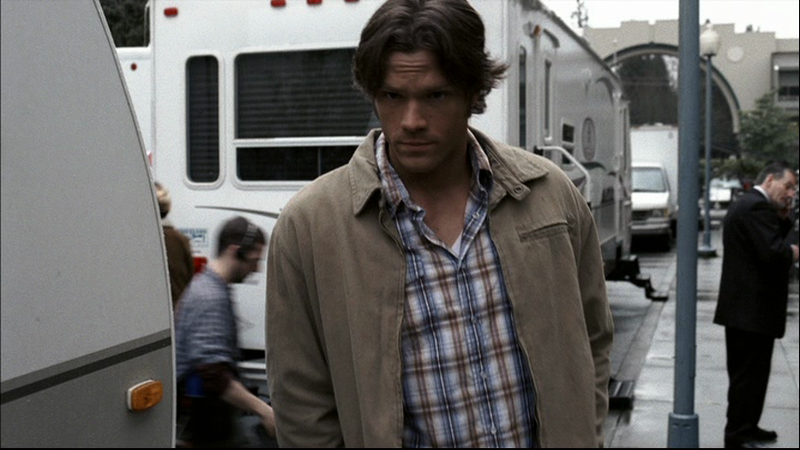 It first appears in Hollywood Babylon (2x18), when Sam wears it after Walters death at the end of the episode – when he runs into Dean exiting Tara’s trailer after going above and beyond the duties of your typical PA. In Metamorphosis (4x04), Sam wears it once they are in Carthage staking out Jack Montgomery and talking with Travis. He changes out of it before confronting Dean and Travis with the idea that they might not have to kill Jack Montgomery.